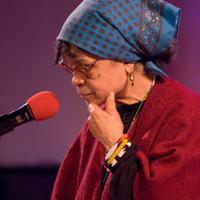 Sonia Sanchez is a lion in literature’s forest. When she writes she roars, and when she sleeps, other creatures walk gingerly. Faced with the fierce urgency of now and the growing number of African Americans who come face to face with the HIV/AIDS pandemic, award-winning poet and activist Sonia Sanchez does what she does best: challenge political and community thought with the power of the word. Does Your House Have Lions (nominated for the 1998 National Book Critics Circle Award for Poetry), written by Sanchez, is an epic poem that explores the life of Sonia Sanchez’s brother who left the South for New York, immersed himself in the city’s gay subculture, and became a vicitim of AIDS in the first years of the pandemic. Sanchez describes her brother’s alienation from his family and his illness and death from AIDS with her characteristic tenderness. This brave epic poem shatters silences surrounding gay sexuality in African-American families. This work will be performed by Sanchez and accompanied by luminaries from the jazz world, including Odean Pope on saxophone, Kenny Gates on keyboard and Lee Smith on bass. Sanchez will be joined by Brooklyn-based dancer/choreographer Ronald K. Brown, founder of Evidence. The work will be followed by a discussion moderated by Esther Armah. Ms. Armah is an author, playwright, radio host and award-winning international journalist. She has worked in print, radio and television in the UK, U.S. and Africa. On radio in London she worked with the BBC as an investigative reporter, a documentary maker and a radio host. As a reporter and journalist she has traveled and worked in London, Washington, Philadelphia, South Africa, Ghana, Nigeria, Kenya and Lesotho. Ms. Armah and Ms. Sanchez will by joined by Dr. Monica Sweeney, Assistant Commissioner for HIV/AIDS for the New York City Health Department; and Phill Wilson of the Black AIDS Institute.